including our Youtube Video and 5k Glow Run Review. No, Kings Island was certainly not closed, but this fun-filled race and roller coastering (is that a word? Well, it is now) weekend sure did give us plenty of opportunities to quote National Lampoon’s Vacation. By this we mean the real one, the one where Chevy Chase as Clark Griswold loaded the family into the family Truckster and made the cross country trip to Wally World. So…“Well I’ll tell you something. This is no longer a vacation. It’s a quest. It’s a quest for fun. You’re gonna have fun, and I’m gonna have fun… We’re all gonna have so much…” yeah, Nick tells me I have to stop this quote right there before this review stops being family friendly. Summer in Ohio is all about hitting up as many awesome roller coasters as one can. When you can combine this with race weekends, all the better! This event would give me a chance to follow up my finish at the Cedar Point Half Marathon with my first ever 5k Glow Run and a whole lot of roller coaster and Halloween fun. The placement of this race weekend square in the middle of the Halloween festivities is the kind of perfect race opportunity that I could not pass up. So I loaded the family in the Wagon Queen Family Truckster (still the most awkwardly named fictional car ever) for a cross country journey…well, not really, we just drove down to Cincinnati for the weekend. No drama, and certainly no on road encounters with Lamborghinis driven by supermodels. 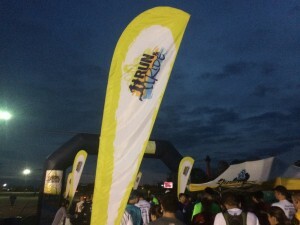 Please check out my review of the 5k Glow Run event for more information on these topics. However, I will add that, when we picked up our half marathon packets, we noticed that we had the wrong park tickets included in our packets. I bring this up for two reasons. First, it reinforces why it is important to always check the contents of your race packets before you leave the packet pickup area. Second, the event volunteers and staff could not have been more friendly or accomodating in getting us the right tickets. The service was great and deserves to be noted. Like with the 5k Glow Run, the race premiums are strong with this one. 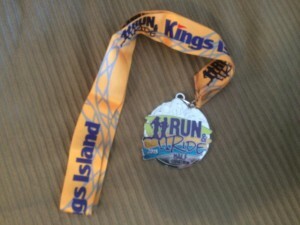 Entry in the half marathon includes a long sleeve tech shirt, a Buff bearing the event logo, and not, 1, not 2, but 3 days of admission into Kings Island, which includes 2 evenings of Halloween festivities. In addition, the tickets included free parking at Kings Island. All in all, this is a very impressive collection of race premiums. Sorry, no glow sticks for this race. Temps at the starting line were only registering 51 degrees, just about the lowest temp I would I still run in my Team Casual Runner running singlet. The rest of my race kit consisted of Layer 8 running shorts, Adidas Climalite compression shorts, Steigen running socks, a Sweatvac hat, Soleus GPS+ watch, and Saucony Virrata running shoes. I also had my Iphone 5S, Yurbud Ironman Series headphones, and a Ziploc bag for moisture protection. I applied a generous amount of Body Glide to prevent chafing, BUT, and this is a big BUT, unlike my last race, I DID make sure to wear band aids to prevent uncomfortable chafing. Score one for sticking to the pre-race checklist. The organizers made things very simple on runners. As the race started several hours before park open, there was a single entrance to the parking lot with attendants directing us where to go. Once parked, we had a short walk to the starting line. We decided to hang out in the car until the last possible minute in order to stay warm, so I really cannot speak too much about the pre-race amenities, but I did see several runners walking back from the Soak City water park where they were using the nice, permanent (and heated!) restrooms. 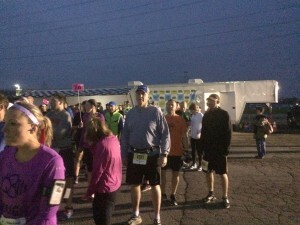 The announcer called the half marathoners to the starting line (the 10k was set to start after we were off). There was an unexplained delay of several minutes. We were not sure what the confusion was, but we did eventually get underway and we were glad to get out onto the course. Do you remember that scene in National Lampoon’s Vacation when Clark insists on parking at the far end of the empty parking lot, and then he and Rusty run to the entrance of the park in slow motion as Chariots of Fire plays? Yeah, the first part of this race was a lot like that, except that, instead of running straight to the park entrance, we went all Magellan and circumnavigated the parking lot. It was fun, and made more so by my constantly replaying of the movie scenes in my own mind (also I probably looked as though I was was running in slow motion!). This actually was a fairly obvious and utilitarian course design as we gobbled up the first 2+ miles in the parking lots, allowing the pack to thin out before we entered the amusement park itself. 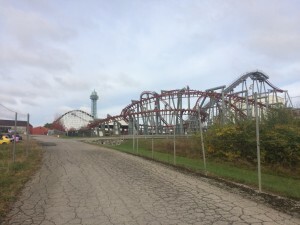 Once in the park – and this is why you pay to run these races – we were treated to a fun sightseeing tour of the majority of Kings Island. The course designer did a great job of maximizing the in-park time. We ran past and among all of the major attractions, several of which were going through their morning test runs, which added some nice kinetics to the race course. Spending some time in an otherwise empty amusement part is a great way to experience it. Unfortunately, I did encounter a costumed 10k runner who decided to pass me on the inside of a tight turn, and when I called out to him to be more careful, he shouted back “no worries.” I don’t think he quite got the meaning of what I was trying to say. Oh well, no worries. We exited the park and made our way out onto the same access road that we took during the 5k (check out the full course review here). As a result, we had to navigate the same hill descents and climbs that we did during the 5k. However, while I did enjoy the views of the roller coasters we experienced on this access road, I did not find it, as a whole, to be as enjoyable as when we ran it at night. The dark of the 5k added a little something more and special to the course. TMI Alert. Once past the Beast it happened to me again, I had to go…as in, I had to go. Unfortunately, this course really was lacking in restroom stop opportunities, and I had to endure for the next 2+ miles until I found one. My patience would be rewarded as I figured there would be bathrooms in Soak City, and there were, and they were open, and they were clean, and they were warm! It was a runner’s in-race bathroom dream come true. I took care of business and was soon back out on the course, except now, after emerging from the heated bathroom, with a heavily sweat-laden shirt, I realized just how cold it was that morning. I am not going to lie, as I was approaching the finish of the 10k, I thought really hard about cutting it short and just calling it a day and collecting a 10k medal instead of the half…but something kept me going and I made the turn to head back out for lap #2. One of my biggest disappointments about the Cedar Point Half Marathon was how little time we spent inside the amusement park itself. The intriguing element of this course design, that addressed that very concern, was that they employed a double loop, which would effectively double the amount of time we would spend inside the park. We started the second loop again in the parking lot, but they shortened the parking lot time on the second go-round. On one of the out-and-backs I saw Candace coming in the other direction, and I decided to do something I have never done before: I stopped in the middle of a race, and crossed backwards on the course to join up with her. I effectively lengthened my race beyond 13.1 miles, but in that moment I decided it would be fun to run the last 6 or so miles together, so we did! Together Candace and I re-entered the park and ran throughout Kings Island, taking in all of the Halloween decorations and had a good time trying to identify all of the skeletons and zombies that were posed as Katy Perry, Beyonce, and unfortunately, a twerking Miley Cyrus. Once out back on the service roads, we decided to walk up all of the hills, and in so doing met a newer runner who was running her first half marathon. She asked for some advice and we offered our encouragement to her, it is always great to be able to help out a fellow Casual Runner. Once back inside Soak City, we knew we were nearing the finish line, just a couple of turns left before we entered the finishers chute. We legged it out and crossed under the archway. And, with that, another fun and successful half marathon was in the books! This medal is the same design that we received at the Cedar Point Half Marathon, which is a nice enough medal but it is not unique to this event. 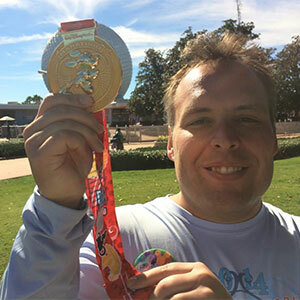 I assume organizers are using the same medal for each half marathon event as these races are a part of a race series, however doing so does reduce the incentive for runners to enter multiple events in the series in the same year, especially when two of them take place at awesome amusement parks in the same state. They did have a lanyard ribbon specific to this event, which is nice design and quality, however they once again used one of those clips to attach the medal to the lanyard that I am on the record as not liking. 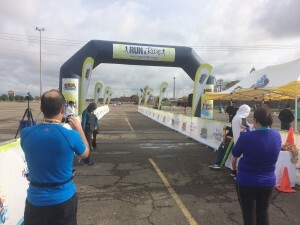 The finish line area included printed results for each runner so you were able to know your finish time almost immediately. They also had a nice selection of beverages and some bagels and bananas. We took this all in for a few minutes, but since we had tickets to the Colts-Saints game that afternoon, we had to hurry up and leave and make the drive to Indiana…yes, there is no time to rest, even for Casual Runners! Sadly, nothing new to report on this front as yet again I recycled an old playlist. However, there was some good music being played inside the park when we ran through it, and so I have some ideas for new songs to add for future races. This was a well-conceived and executed race. The water stations were well-maintained and the volunteers did a good job. Two groups of high school students were particularly enthusiastic in cheering us on. Their enthusiasm was very much appreciated. There was not very much on-course in terms of crowd support, which made the enthusiasm of the volunteers even more beneficial and appreciated. I will certainly keep an eye on this race going forward. It is run at the perfect time of year to take advantage of both the Halloween festivities at Kings Island and the fall foliage in the back portions of the park. I agree with the majority of your comments. I wasn’t actually expecting to love this race as much as I did but it was the very perfect combination of fall decor, tons of in park miles, great volunteers and those horrible steep hills that made you feel unstoppable once you concurred them but I am in love with this race. It’s a must for me next year!! I appreciate your thoughts on the 5k. Thinking this would be a fun add on for us In 2016 and I good way to get my non-running family at least a little involved ( and park tickets ). BTW I saw you as you were rounding to the finish area but then didn’t see you after that. Thanks Stacy for sharing your thoughts, we are glad you enjoyed the race and hope you are back in 2016, just make sure to bring lots of glow sticks if you are going to run the 5k as it only enhances an already fun experience. Next time you see one of us at a race, please make sure to say hi, we’d love to meet you.